I have a work-in-progress for you today: a girly quilt for the Ronald McDonald House charity. 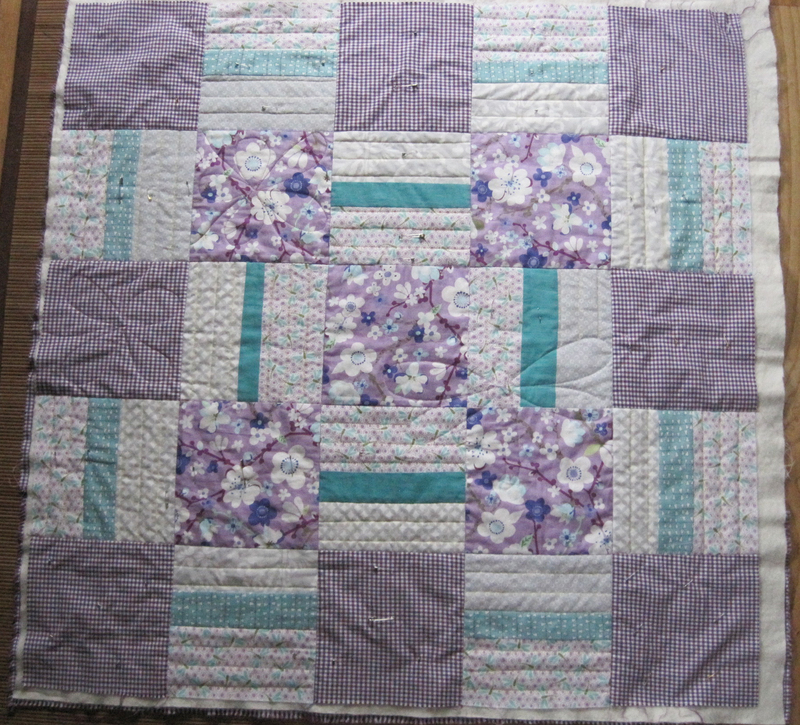 The first quilt I made for them had a boyish vibe, so I thought I’d make this second one a bit more girly. And girly it is. I didn’t have a very clear plan as I making the quilt top. I had only a third of a yard of the two fabrics I wanted to feature—the purple floral and the dragonfly fabric that I picked up at Lavender Street—so I knew I would need to be creative. 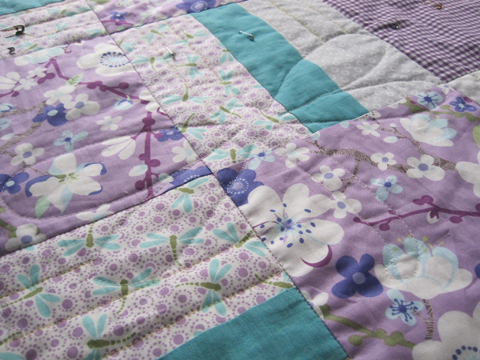 I decided to forgo borders on this quilt and designed the whole 40-inch length and width with 8-inch blocks. I did realize I needed to add something to stretch this to a quilt, so I stopped down to Sewn Studio and picked up the purple gingham. I made the pieced blocks uniform, at least to the extent that there’s a dragonfly print, a teal fabric, and a white and gray print, in that order, in each block. Once I got the blocks cut and pieced, I played around a lot with the layout. 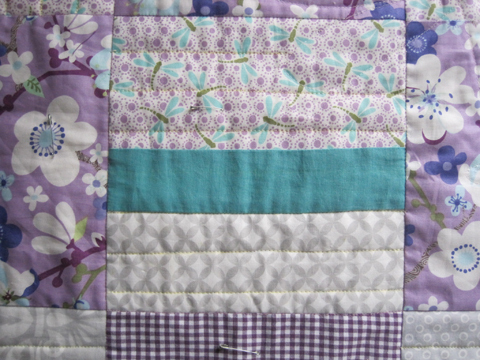 I decided to keep the purple floral central and to use the gingham more as filler. 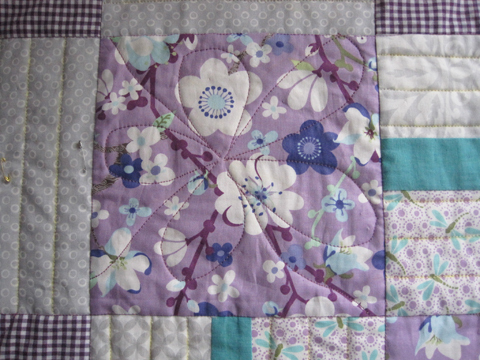 I oriented the pieced blocks so on the inside the dragonflies were toward the purple floral, but they were toward the outside along the edges of the quilt. This made kind of cool pattern of the teal strips, too. For once I actually had enough of one fabric—the purple gingham—for the backing! 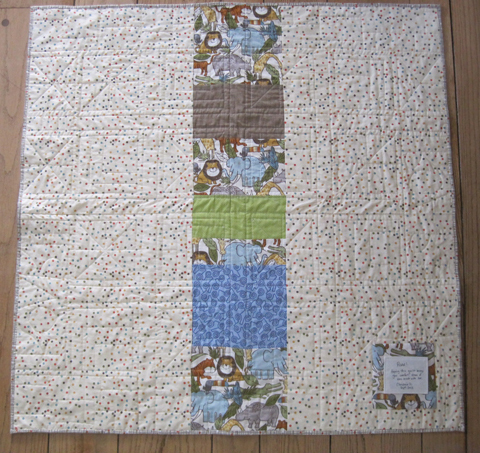 But after cobbling together so many quilt backs, I decided one fabric seemed a bit too plain. So I was super daring and tried my hand at raw-edge applique to create a dragonfly label based on the dragonflies in the print on the front of the quilt. I drew my dragonfly on Lite Steam-A-Seam 2, cut out the pieces, and placed them on fabric. I then cut out the fabric pieces and ironed them to the white and gray background fabric. I used a zigzag stitch to secure the applique pieces, and then pieced the whole label into the backing fabric. 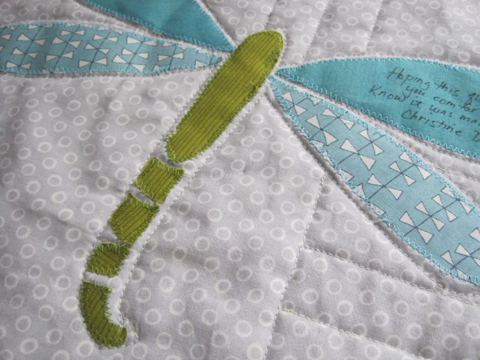 I was so happy with my applique dragonfly that I really didn’t want to mess him up with random quilting. 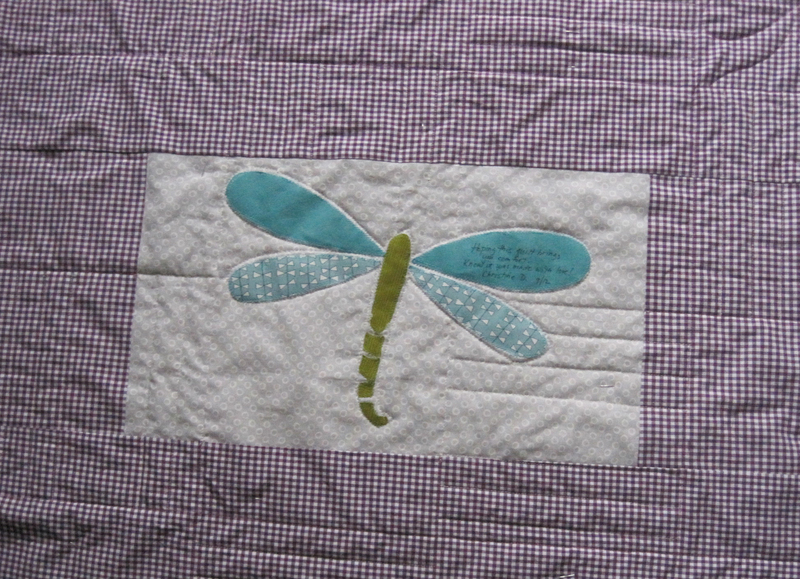 So after stitching in the ditch on the front of the quilt, just enough to get things secure, I turned the quilt over, and quilted around my dragonfly. With that territory now set aside for the dragonfly, I turned the quilt over back to the front, and I’m finishing the quilting, taking care not to bother my dragonfly. I’m doing simple straight lines to mimic the straight lines on the pieced block, and I’ll add a wavy line in each of the teal strips. And for the floral and gingham blocks, I’m trying my hand at flowers using my walking foot. I still have a good bit more quilting to do on this one, but I’m pretty happy with the way it’s turning out. I’m hoping this one will make a little girl feel a bit of comfort in the next few weeks. At nearly every meeting of the Cincinnati Modern Quilt Guild there’s some kind of a swap. Sometimes it’s fabric, but lots of times it’s a finished item, like a mug rug, tote bag or, as was the case for the September meeting, a pot holder! 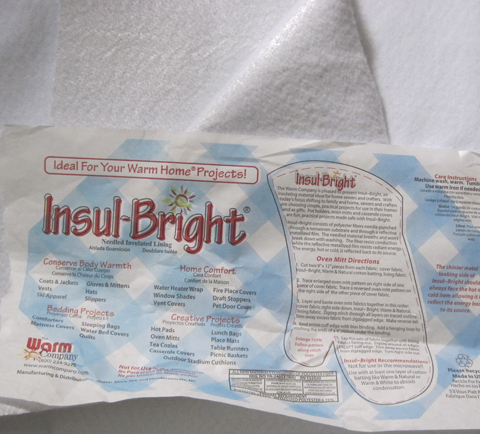 Before the September meeting, I dove into the world of pot holder tutorials and soon realized that, no matter what kind of pot holder I made, I’d need to get some Insul-Bright. 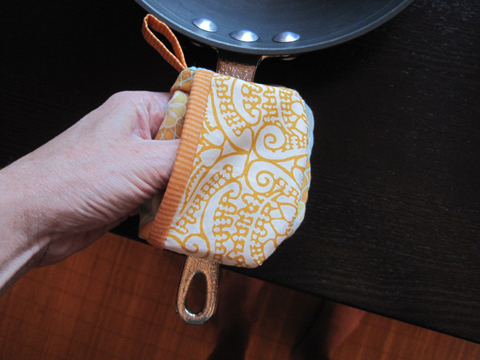 With my Insul-Bright at the ready, I decided to make microwave mitts, small pot holders that are large enough just for your fingers, so you can get into tight spots, like a microwave. 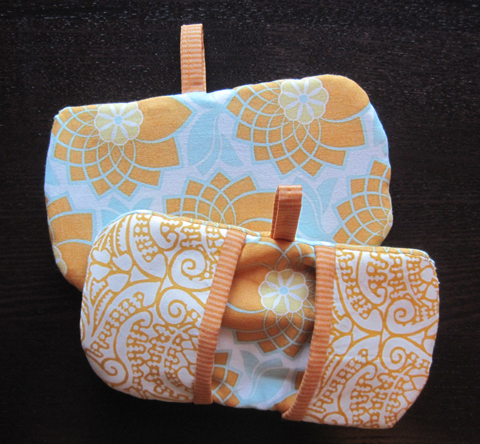 Here’s a link to the microwave mitt tutorial I followed from a blog titled Bits and Pieces. I was feeling just anxious enough about making these that I decided to make a pair for myself first. Those are the mitts shown above and at the top of this post. The instructions direct you to stack the layers of the mitt and sew the edges, leaving an opening for turning. Because I am really bad at visual-spacial thinking, it took me a couple of tries to figure out where to put the Insul-Bright so the shiny side would be toward the hot thing. But after that, they came together pretty well, although my “rounded” edges leave a good bit to be desired. I also added the loops to the sides, since I like to keep my pot holders hanging nearby. 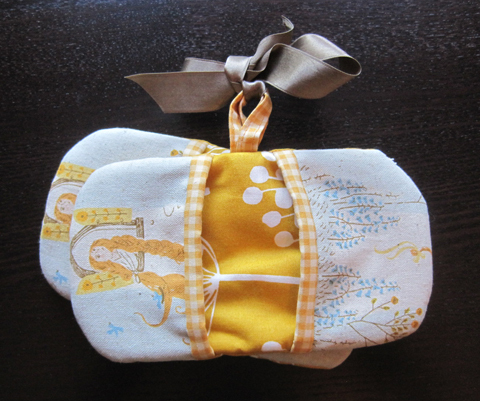 Once I had my prototype done—and knew that it worked—I made the pair above for the quilt guild swap. As luck would have it, Kayla, the guild member who ended up with my pot holders, made the pot holder I received. In record time, I finished the quilting for this quilt that I’ll be donating to our local Ronald McDonald House charity. 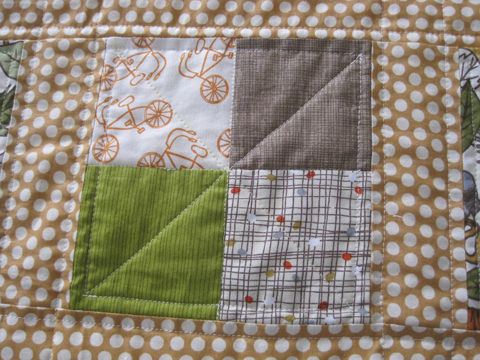 (Here’s my blog post on making the quilt top.) I usually get stalled on the quilting. I don’t practice enough to be good at it, and because I’m not good at it, I don’t practice. You can see my problem. But for this quilt, I decided to dive into the quilting before the first layer of dust settled on the quilt top. 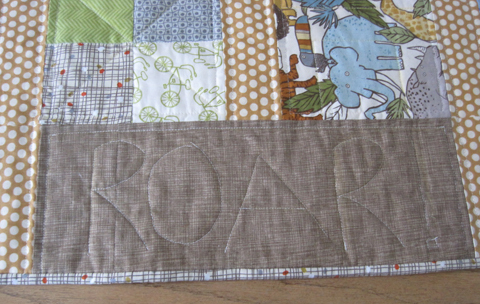 Because of the animal theme, I titled the quilt “Roar,” and I quilted that into the brown fabric on each side of the quilt. 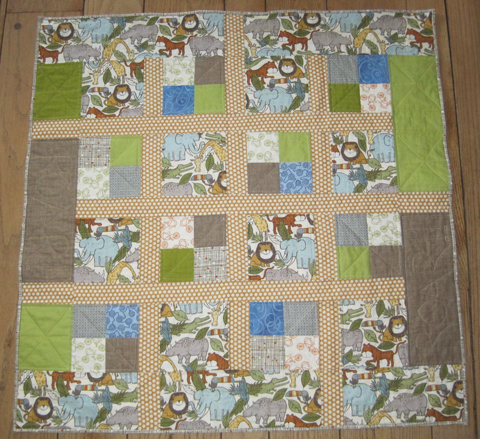 In the four-patch blocks, I just did a simple X and then stitched in the two ditches. 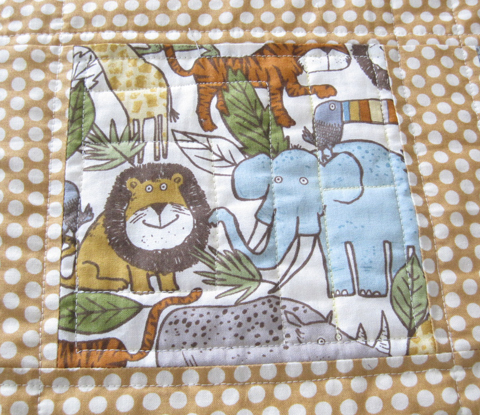 And for the animal blocks, I highlighted one animal face in each, and then added more stitching to fill in the block. You can still see my yellow chalk lines in this photo. And finally, a quick look at the back of the quilt. I had small pieces of the animal fabric left, so I incorporated them into the back along with some of the other fabrics I used from my stash. 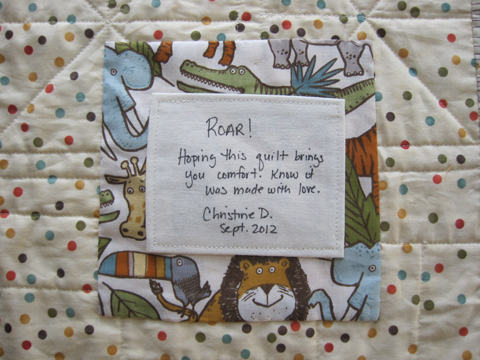 This really was a fun quilt to work on, not only because of the fun animal fabric, but because of the size, too. 40 x 40 rocks! 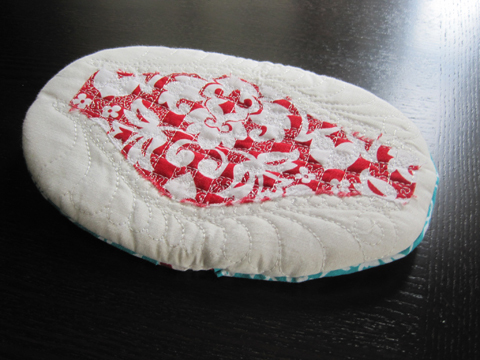 It’s large enough to do a fun design, and small enough to quilt easily—and get done quickly. I think my next charity project will be a girl quilt of this size for the Ronald McDonald House. I’m already gathering girly purple fabrics for it. Back before my all-consuming obsession with fabric, paper was my game. 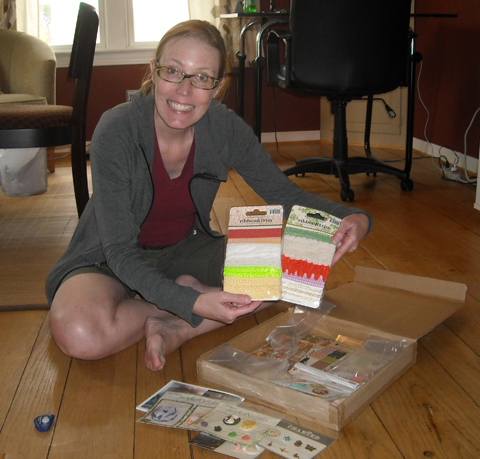 I scrapbooked, made cards, and bought lots and lots of paper. Recently, though, I’ve been having an urge to hit the paper again, but I couldn’t quite get inspired to actually do it. Until this weekend, that is. 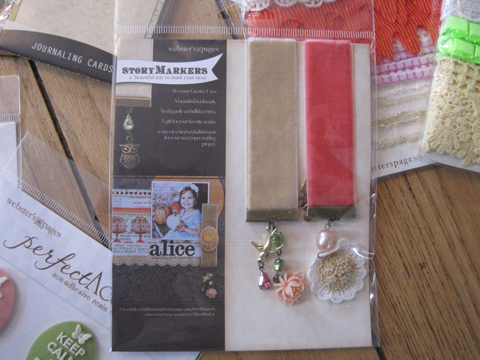 This weekend, I became the lucky recipient of a raffle prize package from Webster’s Pages, manufacturer of fabulous scrapbook papers and embellishments. Earlier this summer I entered the raffle, organized by Charity Wings, to benefit A Place to Bark, a no kill foster and adoption rescue for pets. The founder of A Place to Bark, Bernie Berlin, is a mixed media artist whom I’d worked with in the past. 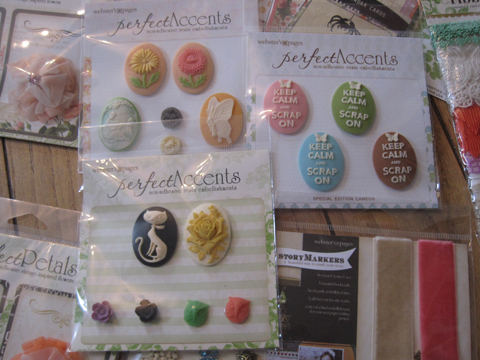 Not only were all the proceeds from the raffle going to the animal rescue, all the prizes were coming from the craft industry. It doesn’t get more win/win than that. After the raffle took place, I checked the list of winner and saw that a “Christine D.” had won the prize from Webster’s Pages! Yay! Except I really tried not to get my hopes up because I know at least one other “Christine D.” who travels in the same crafty circles. Heck, there could be three or four of us. So this weekend, when the FedEx man (a.k.a. “The Present Man”) stopped by, I learned I really was “Christine D.”! The box The Present Man brought was full of wonderful goodies from Webster’s Pages’ new Park Drive and Once Upon a Halloween lines. There were ribbons! 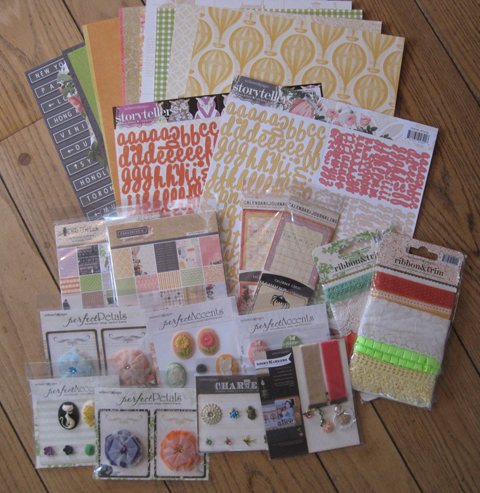 And lots of paper and alphabet stickers! All sorts of seriously cool stuff. So, really, how could I not be inspired? Tuesday afternoon I dipped my toes back in the paper waters, and I made these cards especially for three paper friends who have endured my fabric obsession long enough. Almost everything I used came from the Park Drive line—I love the color palette! 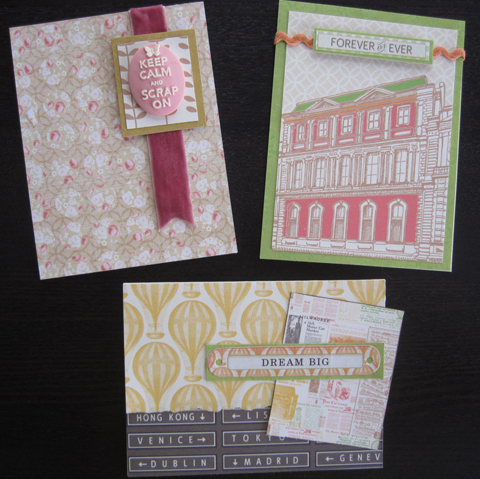 The reduced motifs in the 6 x 6 Paperpad Collection and Calendar & Journaling Cards are perfect for card-making. 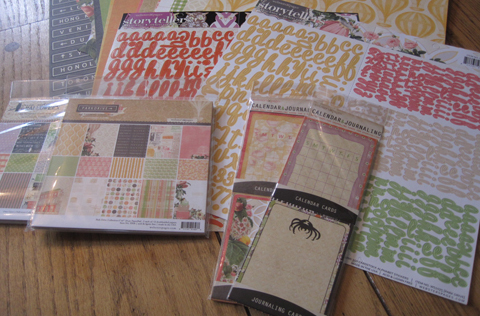 And I still have all my 12 x 12 sheets to play with the next time I scrapbook. Thank you to Webster’s Page for this awesome prize and to Charity Wings for organizing the benefit! It feels good to be paper inspired again.